on saturday we woke up slowly and got ready for the game. 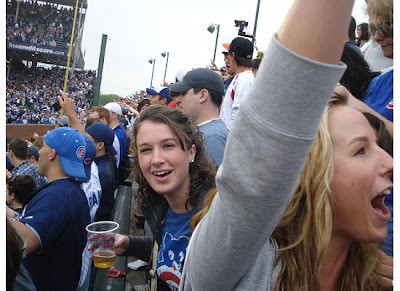 we took a cab down to wrigleyville and made our way to the bleachers. before long we'd made friends with pretty much everyone within a five person radius. what can i say? we're a fun group of girls. the one person we didn't make friends with (but certainly ogled) was the one and only bill murray! i pretty much bailed on the cleanse as soon as we stepped foot inside. there was no way i could go to a baseball game and not have a chicago hot-dog. and...it was amazing. 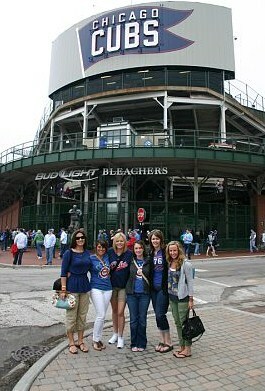 even though the cubs played terribly, we had so much fun. the seventh inning stretch was great. 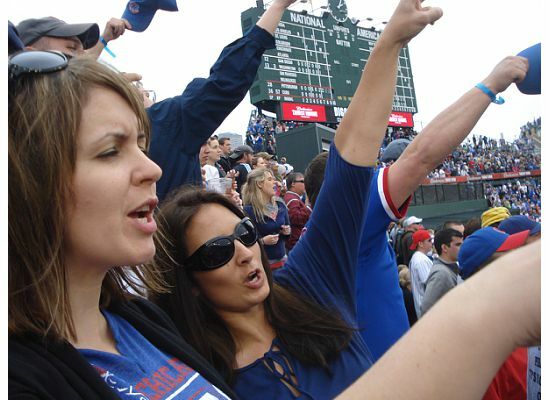 singing "take me out to the ballgame" with thousands of people is pretty sweet! 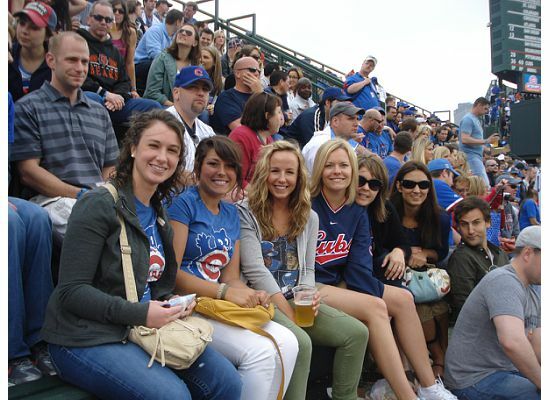 after the game, we hung out in wrigleyville for a while. it was a blast. just a sea of rowdy fans, all decked out in blue & red. at some point, we made our way back to the hotel to get ready for the evening. we ended up going to this russian dance club where we were completely out of our league, but had a blast. this place was unlike anywhere i've ever been; a long line at the door with people getting turned away left & right, bouncers wearing mink collars on their three-piece suits, an ice bar area where you could put on a fur coat & hang out, half-nekkid dancers on a glass catwalk--i'm tellin' ya, this place was crazy. but a super fun experience for us small-town gals. apparently i didn't get the "stop-dancing we're taking a picture" memo. after a few hours of shakin' our tail feathers (do people still say that? obviously i'm old and completely un-hip), we crammed into a cab for the last time that weekend. the next morning we sadly packed our bags and headed for home. we stopped at the amazing outlet mall in aurora for a couple hours of shopping, and spent the rest of the drive looking through all our pictures from the weekend, re-telling the same stories and cracking the same inside jokes. obviously i can't do the trip justice with a few pictures and paragraphs, but we had so. much. fun. it was exactly what we needed and we're already planning next year's trip! 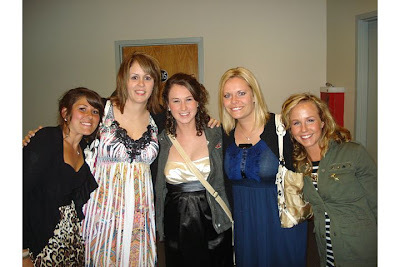 I am so happy for you and so completely envious that you have such an amazing group of girlfriends! I have a few awesome ones, but they don't know each other and we live all over the country, so we never get together as a group. It looks awesome. So glad you posted the pictures. I had a great time just imagining the ball game and that snazzy-sounding (yep, I'm old, too) dance club. Welcome home! I am with Erin I have got some amazing friends but they are all different and dont know each other makes it hard to get together. Looks like you had a great time! I enjoyed looking at the pictures and pretending I knew how much you had!! So happy for you!